I am an admission counselor here at the College and I cover the Tidewater area and other states, including Louisiana, Arizona, Illinois, Alabama, Michigan, Nevada, Hawaii, Wisconsin, and some others. 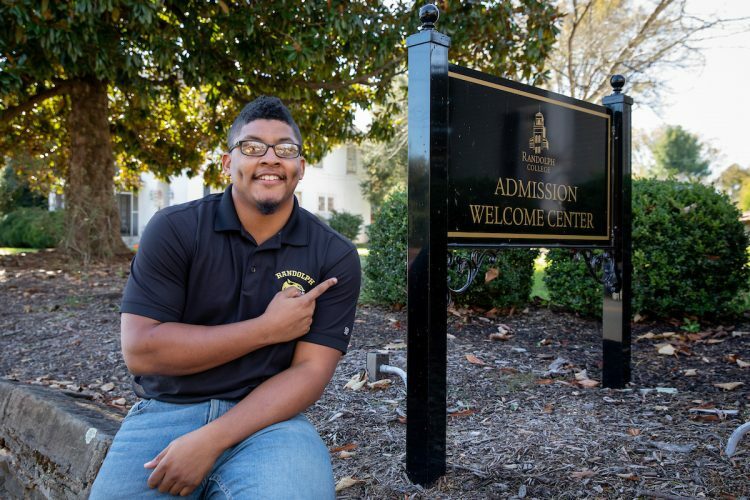 I oversee applications and travel to high schools and college fairs to meet with and provide insight on Randolph College to interested students. As an alum (Class of 2016), it’s fun to help the place I call home. What was it like being a student at Randolph? At Randolph, I was able to grow as a person, student, and athlete by exploring and pushing my limits. Randolph offers opportunities for students to take advantage of, but it takes the student being proactive. I became more proactive as time moved forward, allowing me to explore my options. What was one of your favorite experiences as a student? One of my favorite moments as a student was presenting on a slave collar of African trade from the St. John’s slave revolt in the Virgin Islands that a classmate and I discovered during a class in a pile of artifacts. Randolph sounds like it was a good fit for you. How do I know if it is for me? One major way to find out is to visit the campus. Typically, you get a feel or vibe for a campus from its energy. What happens on visit days? Visit days will include a tour, and we are pretty flexible with personal touches, from lunch, sitting in on classes, meeting professors, and overnight stays. The next big event is Nov. 10, but you can find the full schedule at http://www.randolphcollege.edu/admission/visit/. What’s the simplest way to apply to Randolph? You can apply on our website at http://www.randolphcollege.edu/admission/apply/ and it’s free of charge. It’s a simple application, and all we require with it are transcripts and test scores. We always recommend an essay as it helps us get to know the student. What kinds of financial aid does Randolph offer? All of our aid is merit and need based. You can find out more at http://www.randolphcollege.edu/financialaid/scholarships/. We have one deadline, and that is the main enrollment deadline on May 1. But students that apply and are admitted before the end of 2018, depending on GPA, will receive certain scholarship awards. How’s the food at Randolph? I still eat in the dining hall for my lunch break all the time. But my favorite day is towards the end of the year when they serve crab legs and shrimp! The rooms are decent-sized, and some of them are really unique with slanted ceilings and unique shapes. We also have singles, doubles, and triples. We offer overnight visits with current students if you want to check them out in person!